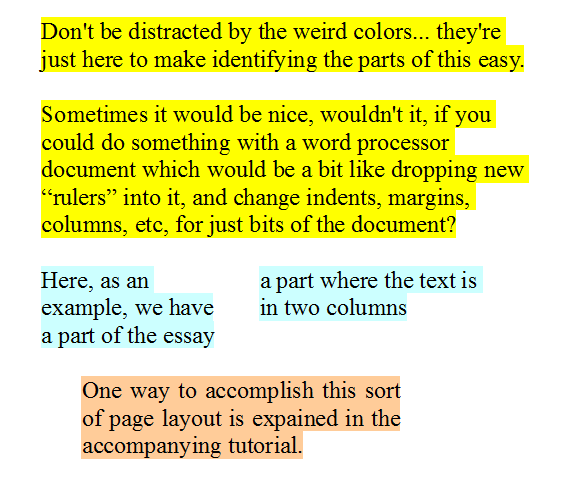 A quick note about doing something in Open Office's "Writer", the word processor module. (This note done using Open Office version 4.1.1 I don't expect that is going to make much difference, but if you are using 4.1.1, you should find the following works exactly. As the text says, you might imagine that the "secret" is some way to drop extra rulers into the text... as if the yellow part is governed by a ruler at the top of the page, and then a new ruler is inserted before the cyan part, and finally a third ruler is above the salmon colored text. It could have been written like that... but it wasn't. The first thing to grasp is that each paragraph has it's own ruler! Many things can be taken care of by tweaking the paragraph's ruler. Just click somewhere in the paragraph, and use the graphical tool at the top of the page to adjust margins, indents, tab stops. But if you try to set up different columns specifications for different parts of the page, as in the example, you may find that challenging. "The trick" is to use what Writer calls a "section". After I'd written the yellow paragraph, I went to the menu, clicked "Insert/ Section". Besides creating the section, I also set the column provision as I wanted it. Another of the "tricks": When you come back from inserting the section, use the mouse to click somewhere within the section you have create before you try to enter text. Enter a bit of text, and then set about fine-tuning the settings of the section, to get the result you want. You get into them with Format/ Sections. If, as often happens to me, you get a tall narrow column of text, one letter to the line, have a look at how the margins and indents are set in the ruler. Sometimes the little "things" that you drag in the ruler to establish the left and right margins become... confused. Fiddle with them, and soon all will be well. So that gives us our two column part in the center of the document. I only had to click just below the two column part to go back to entering the next paragraph, which, like any others, could have it's width, etc, controlled with the ruler at the top of the page. A machine readable copy of the Writer document can be downloaded. It doesn't use any macros. Unless you can't, set your OpenOffice so that it will ask you before running macros... they are a great way to get a malware infection. Search across a selection of all the pages on various sites with the Google search button at the top of the page the link will take you to. Here are some ways to contact this site's editor, Tom Boyd. Page tested for compliance with INDUSTRY (not MS-only) standards, using the free, publicly accessible validator at validator.w3.org. Mostly passes. There were misc "unknown attributes" in Google+ button code and the Google Translate code. Sigh.